The Federal Reserve Board recently reported that growth in consumer credit outstanding decelerated in January 2014. Total consumer credit outstanding rose by 5.3% on a month-over-month seasonally adjusted basis, but the January growth rate was 0.9 percentage points less than the 6.2% growth rate that took place in December. There is now $3.1 trillion in total consumer credit outstanding. The slowdown in consumer credit growth reflected a monthly decline in revolving credit. According to the release, revolving credit, which largely measures consumer credit card debt, fell by 0.3% in January after rising by 4.3% in December. As Figure 1 illustrates, the decline in revolving credit was generally widespread amongst major revolving credit holders. Revolving credit held by depository institutions fell by $18.9 billion while finance companies saw their revolving credit holdings shrink by $2.4 billion. Revolving credit held at credit unions and nonfinancial businesses also fell. Only revolving credit held in pools of securitized assets saw a monthly increase. However, these pools, which are outstanding balances upon which securities have been issued, accounted for 4% of revolving credit outstanding. Neither the federal government nor nonprofits and educational institutions hold revolving credit. Overall, the decline in revolving credit was more than offset by an increase in non-revolving credit. The release indicates that non-revolving credit, which is largely composed of auto and student loans, rose by 7.5% in January, 0.6 percentage points faster than the 6.9% growth that took place in December. However, much of the January increase in non-revolving credit was not held by the institutions that also hold revolving credit. Rather, it was held by institutions that do not engage in revolving credit lending. As Figure 2 illustrates, total non-revolving credit rose by $33.1 billion, more than offsetting the $21.6 billion decline in total revolving credit outstanding. However, $27.6 billion, 83.4%, of the $33.1 billion increase in non-revolving credit was held by the federal government, non-profits, and education institutions. The remaining $5.5 billion was held by institutions that also hold revolving credit and only partially offset the decline in revolving credit that was held by this group. The release indicates that while total non-revolving credit growth more than offset total revolving credit decline, leading to an overall increase in consumer credit outstanding, this phenomenon did not take place at the institutional level. Instead, institutions holding revolving credit saw their net holdings of consumer credit shrink while institutions that only hold non-revolving credit saw their consumer credit holdings grow. Data released by the Federal Reserve Bank of New York shows that aggregate consumer debt increased in the fourth quarter of 2013 by 2.1%, or $241 billion, from its level in the third quarter of 2013. According to the release, household debt now totals $11.5 trillion. This is the largest quarter-over-quarter increase seen since the third quarter of 2007. Over 2013, total debt outstanding rose by $180 billion or 1.6%, the first time since the fourth quarter of 2008 that aggregate consumer debt has risen on a 4-quarter basis. Despite the increase in debt outstanding, overall consumer debt remains 9.1% below the peak level of $12.7 trillion that was recorded in the third quarter of 2008. 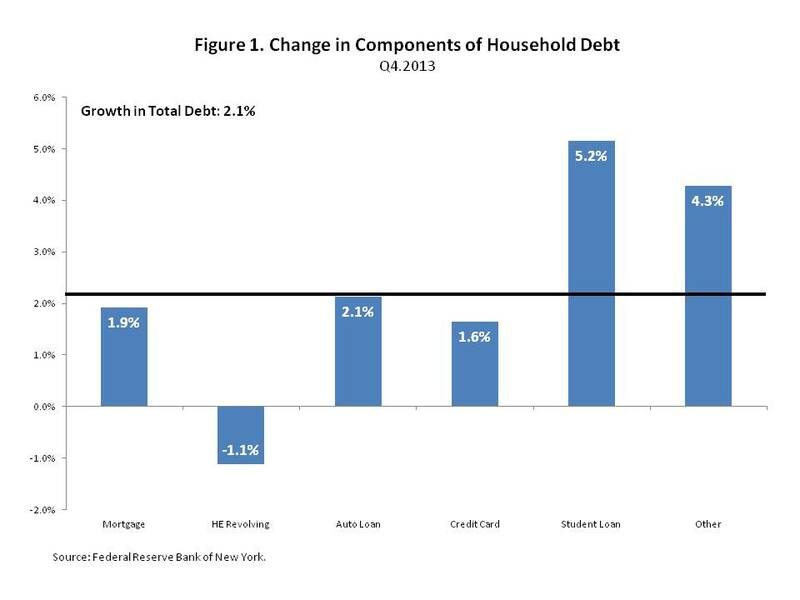 Figure 1 illustrates the quarterly growth rate in the components of household debt. According to the chart, growth in mortgages, 1.9%, auto loans, 2.1%, credit cards, 1.6%, student loans, 5.2%, and other consumer loans, 4.3%, all contributed to the quarter-over-quarter increase in aggregate household debt; with student loan debt and other consumer debt recording the highest quarterly percent increases. Other consumer debt includes consumer finance (sales financing, personal loans) and retail (clothing, grocery, department stores, home furnishings, gas, etc) loans. However, the gains made in these five loan categories were offset by a decline in the amount of household debt attributable to home equity lines of credit. Over the fourth quarter of 2014, this category of debt fell by 1.1%. An earlier post showed that the recent recovery in house prices was contributing to an expansion in home equity. However, households may be averse to borrowing against this asset. Data from the Federal Reserve Board’s Senior Loan Officer Opinion Survey indicates that while a net increase of bank officers reported that their financial institution eased its lending standards on home equity lines of credit over the fourth quarter of 2013, demand for these financial products weakened, on net. This suggests that the recovery in home equity may have a moderate impact on both a household’s spending and investment. According to Figure 2, 2.8% of loan officers reported that lending standards on home equity lines of credit had eased over the quarter, a gross of 7% reported that their bank had eased standards while 4.2% mentioned that their bank had tightened standards. 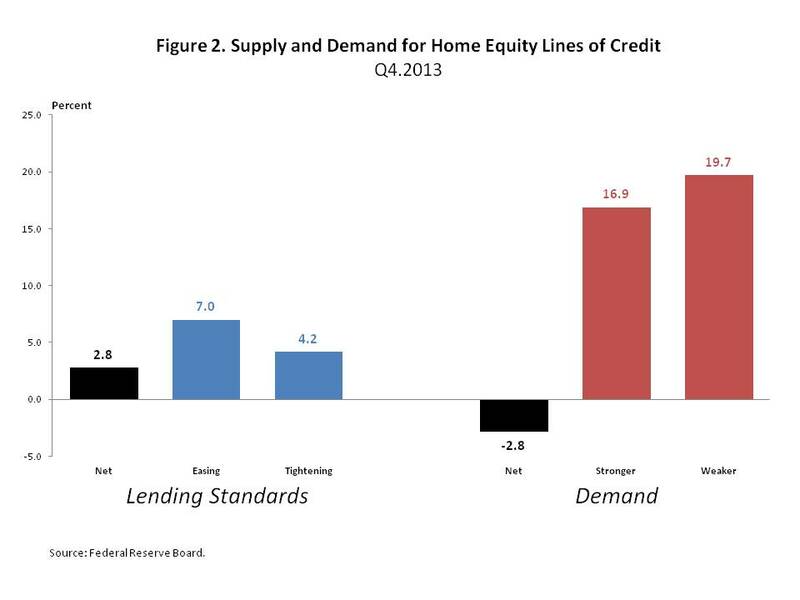 Meanwhile, a net of 2.8% of loan officers reported that demand for home equity lines of credit had weakened, 16.9% reported that demand had strengthened while a gross of 19.7% answered that demand had weakened. Recently released data from the Federal Reserve Board shows that seasonally adjusted consumer credit outstanding rose by 7.25% in December 2013 to $3.1 trillion. Revolving credit, which is composed of credit cards, grew by 7.0% while non-revolving credit, largely composed by student loans and auto loans, increased by 7.4%. Over the year of 2013, growth in consumer credit accelerated by 0.1 percentage point to 6.2% from 6.1% in 2012. Growth in revolving credit accelerated to 1.9% in 2013, from 0.4% in 2012 while growth in non-revolving credit, which occurred at a higher rate, decelerated in 2013 to 8.0% from 8.7% in 2012. An earlier post illustrated that lending standards on consumer loans, excluding prime mortgages, eased on net at large depository institutions in the fourth quarter of 2013. The not seasonally adjusted consumer credit data indicates that the easier lending standards at depository institutions reported earlier coincided with growth in the amount of consumer credit outstanding from this major holder. According to the release, depository institutions are the largest holder of consumer credit outstanding, accounting for 41.1% of consumer credit outstanding in the fourth quarter of 2013. Figure 1 illustrates that growth in consumer credit issued from depository institutions was highest among all major consumer credit holders. 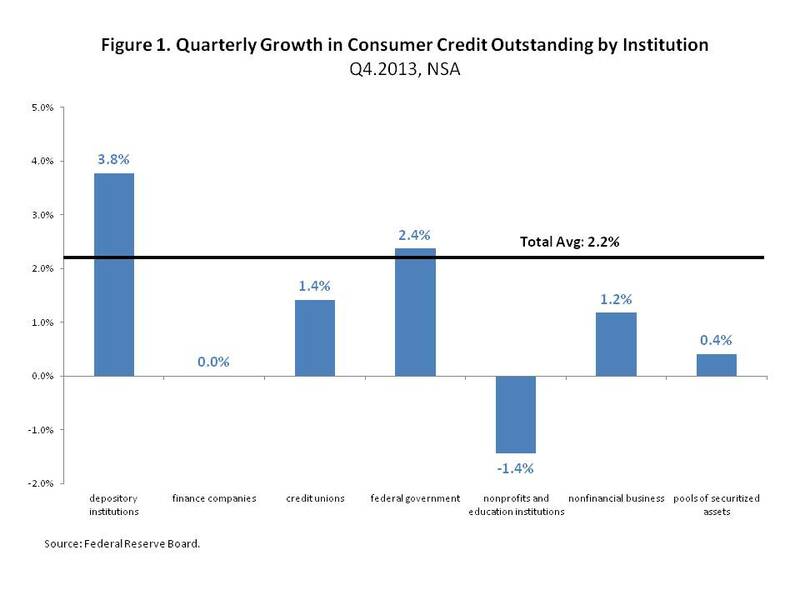 According to the chart, consumer credit outstanding at depository institutions rose by 3.8% in the fourth quarter of 2013, 1.4 percentage points greater than the 2.2% growth rate in not seasonally adjusted consumer credit outstanding over the 4th quarter of 2013. Consumer credit from the federal government, which is largely composed of student loans, rose by 2.4% over the quarter. Meanwhile, growth in consumer credit outstanding at credit unions, nonfinancial businesses, and pools of securitized assets grew less than the total growth in the 4th quarter of 2013. 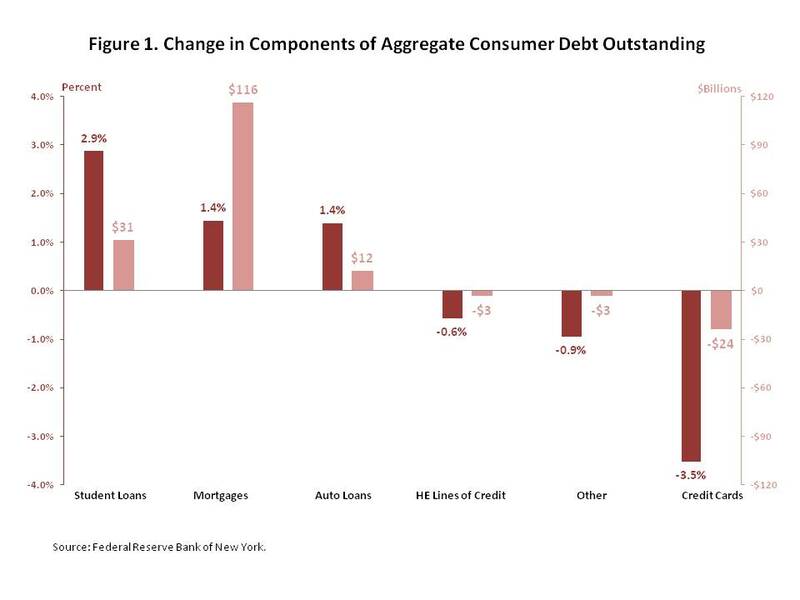 Consumer credit outstanding at finance companies was virtually unchanged over the quarter while at nonprofits and educational institutions, growth in consumer credit outstanding declined. Data released by the Federal Reserve Board indicates that consumer credit outstanding rose at a seasonally adjusted annual rate of 4.8% in November. The amount of consumer credit outstanding now totals $3.1 trillion. The November expansion of consumer credit outstanding mostly reflects a 6.4% increase in non-revolving debt. Non-revolving debt outstanding, which is largely composed of student loan and auto debt, now totals $2.2 trillion. Revolving debt, which is largely composed of credit cards, also contributed to the expansion in total consumer credit outstanding, rising by 0.6% over the month of November. There is $857 billion in revolving credit outstanding. An earlier post illustrated that the rise in student loan debt largely accounts for the expansion in total consumer credit outstanding. 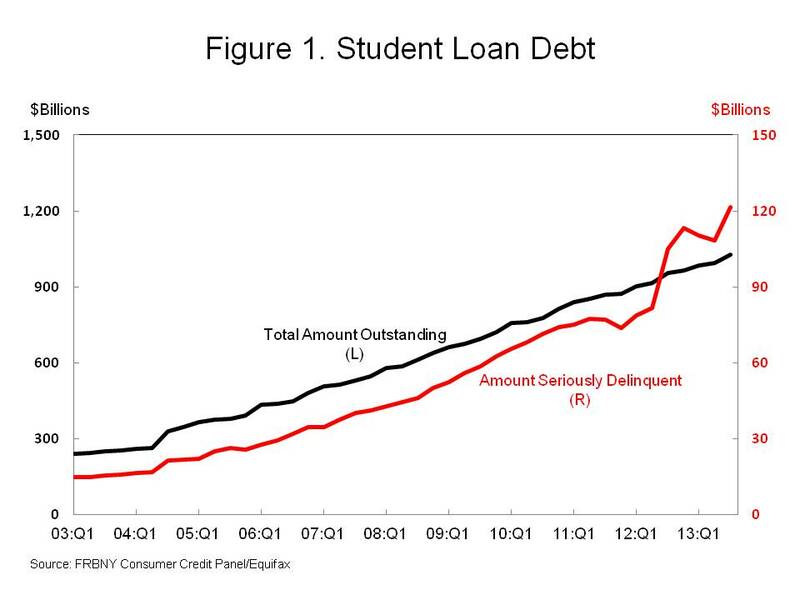 As Figure 1 illustrates, the expansion of student loan debt outstanding coincides with an increase in the amount of student loan debt that is 90 or more days delinquent, considered serious delinquency. Seriously delinquent student loan debt is rising partly because the amount of student loan debt outstanding is growing. But as Figure 2 illustrates, the rate of serious delinquency is also increasing. In recent quarters the serious delinquency rate has spiked, even as the serious delinquency rate for other consumer credit products has declined. In the fourth quarter of 2011, the share of outstanding student loan debt that was seriously delinquent stood at 8.5%. One year later, that share rose to 11.7%. It is currently 11.8%. At the same time, the shares of seriously delinquent auto and credit card debt are falling from their recession-era highs. 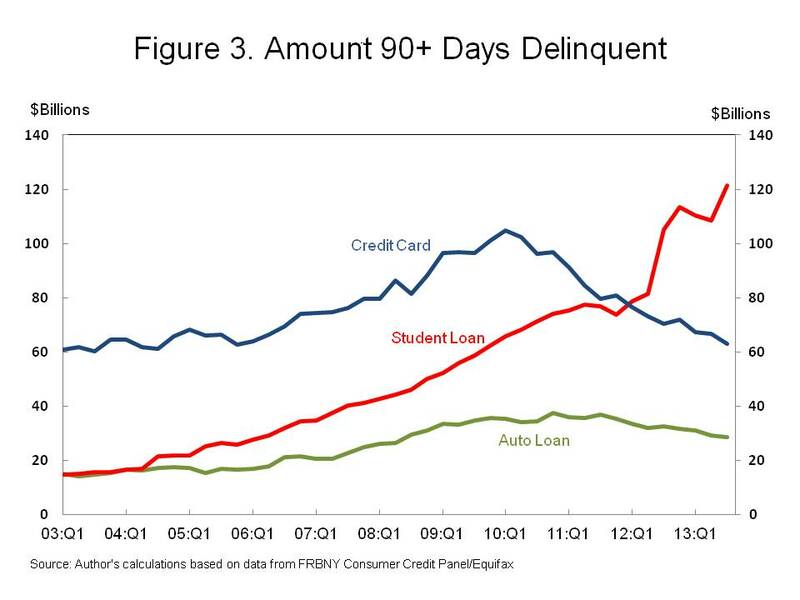 Figure 3 illustrates that the amount of seriously delinquent student loan debt is now nearly twice the amount of seriously delinquent credit card debt and roughly 4 times the amount of auto loan debt. A rising serious delinquency rate will limit homeownership among younger households. According to the Federal Reserve Bank of New York (see p. 18 of linked .pdf), student loan borrowers between the ages of 25 and 30 that are seriously delinquent on their student loan debt typically account for less than 2.0% of new mortgage originations extended to student loan borrowers in this age cohort. Recently released data from the Federal Reserve Board indicates that consumer credit outstanding is continuing to expand. According to the release, total consumer credit outstanding increased at a seasonally adjusted rate of 5.4% in September. For the quarter overall, consumer credit rose by 5.2%. The September increase in consumer credit reflected an 8.7% increase in non-revolving credit, which encompasses student loans and auto loans. 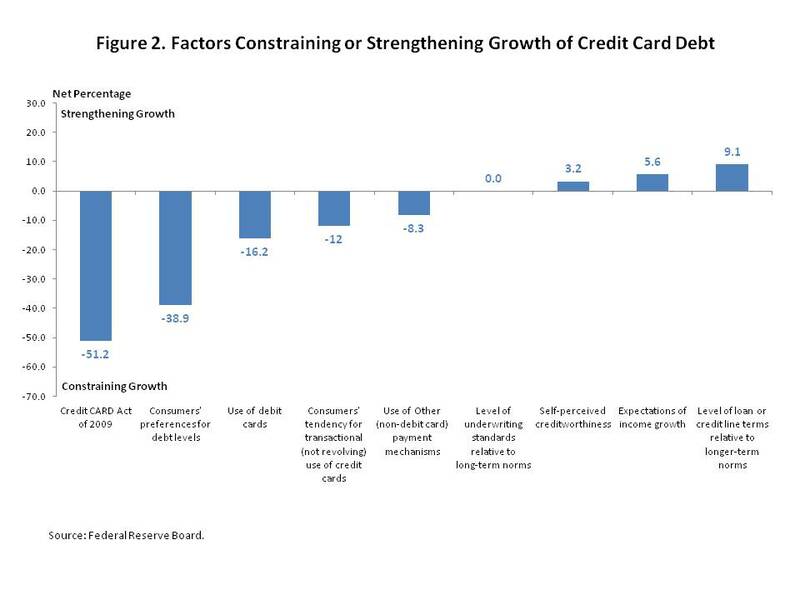 However, the growth in non-revolving credit was partially offset by a 2.9% decline in revolving credit, which is largely composed of credit card debt. Total outstanding consumer credit totaled $3.1 trillion at the end of September; 72.2%, $2.2 trillion, of this total represents non-revolving credit, while revolving credit accounts for the remaining 27.8%, $0.8 billion. An earlier post demonstrated that student loans are major source of the growth in consumer credit. However, the underlying data also indicate that the federal government is becoming a large holder of consumer credit outstanding. 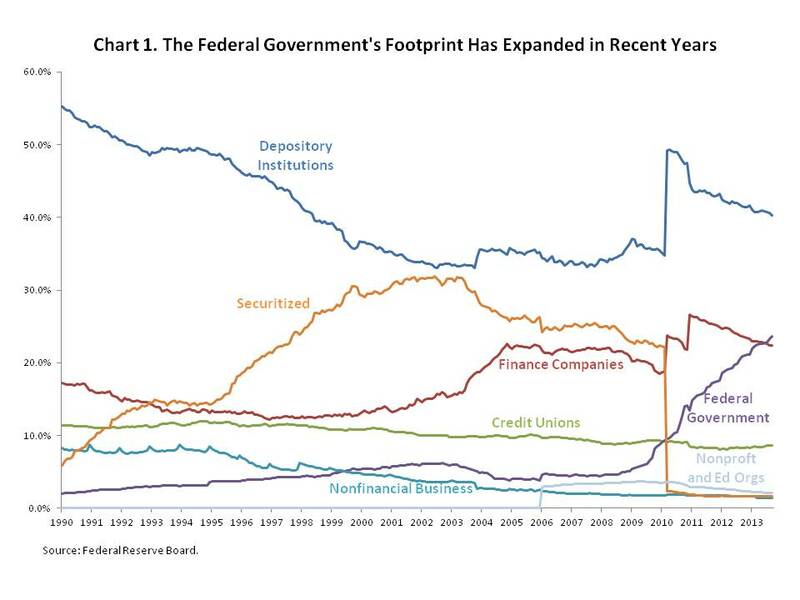 As Chart 1 below illustrates, the federal government was the smallest source of consumer credit in 1990. At the beginning of that year, the federal government accounted for 2.0% of consumer credit outstanding. By September 2013, the federal government accounted for 23.6% of consumer credit outstanding. Most of the rise in consumer credit outstanding held by the federal government has occurred only recently. Since March 2010, following the shift of consumer credit from pools of securitized assets to other categories largely due to financial institutions’ implementation of the FAS 166/167 accounting rules, the share of consumer credit held by depository institutions and finance companies has declined while the share of consumer credit held by the federal government has risen. In March 2010, the share of consumer credit held by depository institutions was nearly half, 49.2%, of all consumer credit outstanding and the share held by finance companies was nearly a quarter, 23.7%, of consumer credit outstanding. 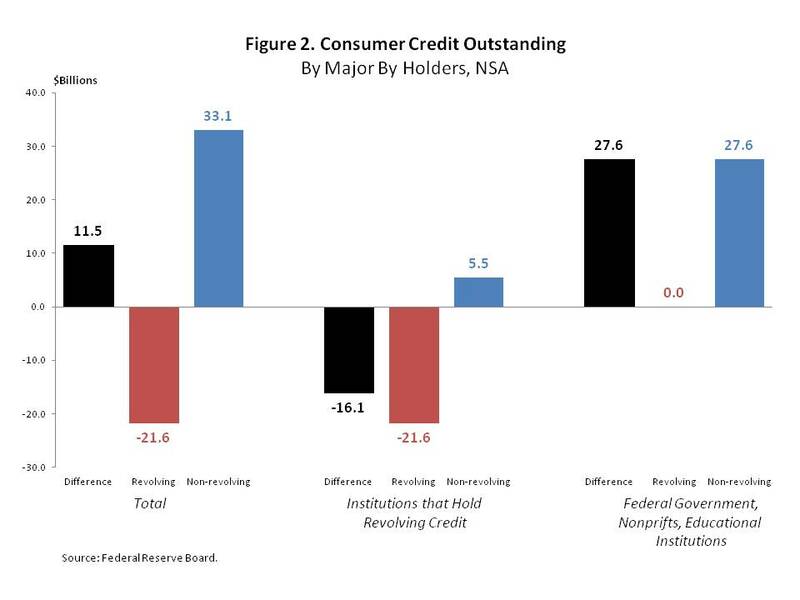 Meanwhile the federal government held 9.6% of consumer credit outstanding. By September 2013, the share held by depository institutions fell to 40.3% and the proportion held by finance companies declined to 22.4%, but the percentage of consumer credit held by the federal government rose to 23.6%. According to the release, the federal government only holds non-revolving credit. It does not hold revolving credit. 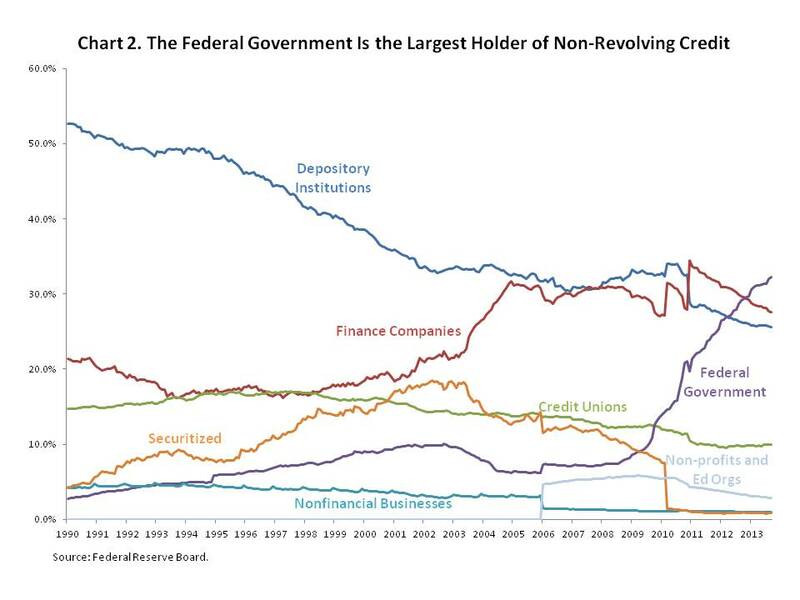 As Chart 2 shows, the federal government has grown to become the largest holder of non-revolving credit. This was not always the case. In 1990, the federal government held a very small portion of non-revolving credit. Over the years, the decline in the share of non-revolving credit held by depository institutions coincided with an increase in the portion held by finance companies and that was securitized while the share of non-revolving credit held by the federal government remained small. However, in recent years, the percentage of non-revolving credit held by the federal government has soared at the expense of the share of the market held by depository institutions and finance companies. According to the Federal Reserve Board, non-revolving credit held by the federal government includes student loans originated by the Department of Education under the Federal Direct Loan Program and the Perkins Loan Program, as well as Federal Family Education Program loans that the government purchased under the Ensuring Continued Access to Student Loans Act (ECASLA) that was passed in May 2008. The ECASLA provided the Department of Education with the authority to purchase student loans. The beginning of the steep increase in the share of non-revolving credit held by the federal government that began in 2009 coincided with the passage of the ECASLA and indicates that, in addition to making student loans directly, the federal government purchased student loans in an effort to facilitate market access at a time when private capital on its own grew scarce. Data from the Federal Reserve Board indicates that consumer credit continues to expand. According to the most recent release, the total amount of consumer credit outstanding rose by an annual rate of 5.4% in August to $3.0 trillion. In July, consumer credit rose by 4.1%. The acceleration in consumer credit outstanding partly reflects a higher rate of growth in non-revolving credit. Per the release, non-revolving credit, which is primarily composed of student loans and auto loans, grew at an annual rate of 8.0% in August, 1.2 percentage points faster than the growth rate that took place in July. 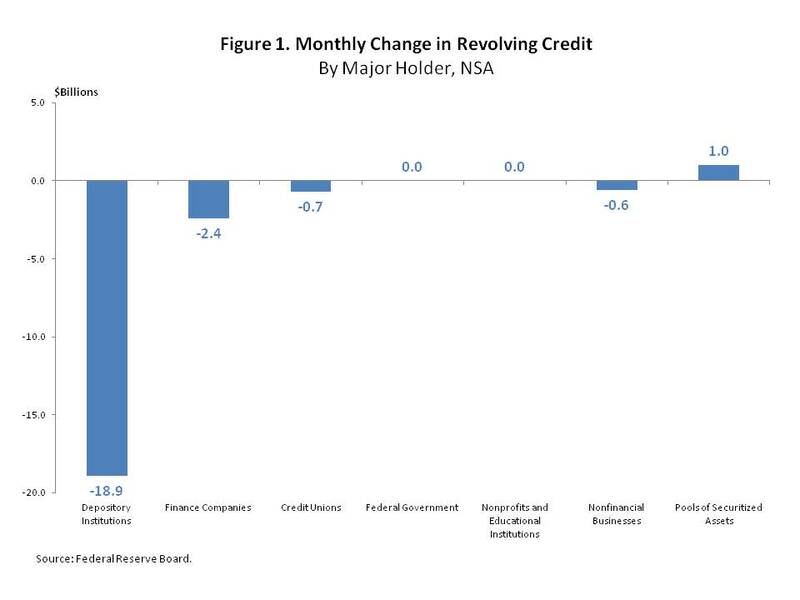 At the same time, non-revolving credit declined by 1.2%. However, the pace of decline in August was less than the 2.6% contraction that took place in July. According to new data in the Federal Reserve’s G.19 Consumer Credit release, growth in auto loans has been accelerating on a year-over-year basis for six consecutive quarters ending in the second quarter of 2013. In the latest G.19 release, the Federal Reserve Board provided estimates, on a quarterly basis and without a seasonal adjustment, of student loans and auto loans outstanding. As the chart below illustrates, the amount of auto loans outstanding has risen at an increasing rate since the first quarter of 2012. 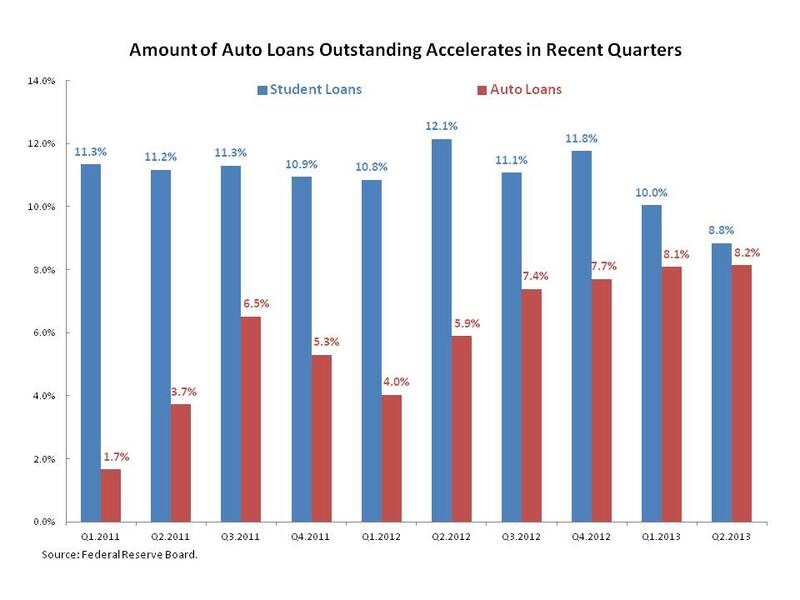 However, growth in student loans, which has slowed in recent months, still exceeds the growth rate in auto loans. In addition, the amount of student loans outstanding, $1.2 trillion, is greater than the amount of auto loans outstanding, $841 billion. 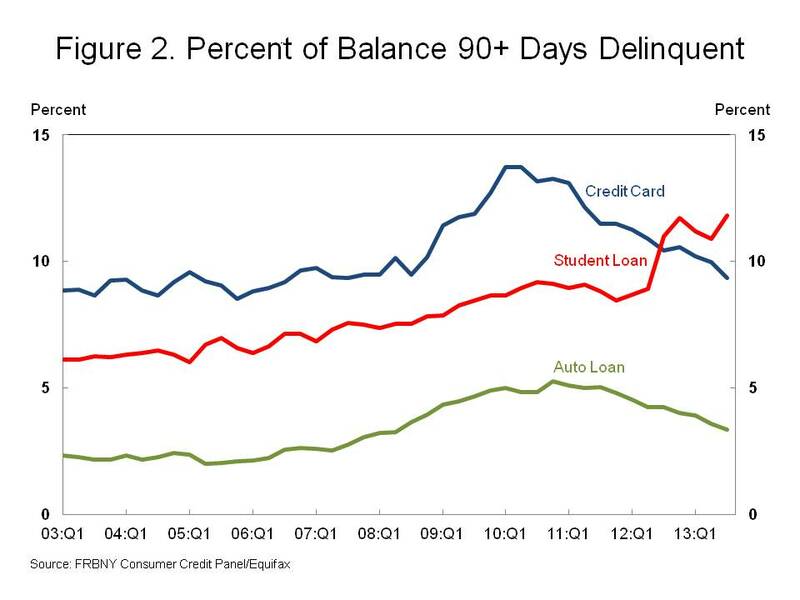 As a result, student loans have been the primary driver behind the expansion in outstanding consumer credit. The Federal Reserve Board is a self-funded federal government agency and doesn’t rely on congressional appropriations to fund its activities. As a result, the federal agency is still operating during the “government shutdown”.